North Korea threatened to take “merciless self-defense” measures if the US tries to enforce a naval blockade against the reclusive state as part of sanctions. US Secretary of State Rex Tillerson mentioned the “right to interdict maritime traffic transporting goods” to and from the North after the country on Nov. 29 test-fired an intercontinental ballistic missile potentially capable of striking anywhere in the US. Several academics and military experts have called for a naval blockade to contain North Korea. South Korea, however, has reiterated its opposition to any military options including a preemptive strike. “Should the US and its followers try to enforce the naval blockade against our country, we will see it as an act of war and respond with merciless self-defensive counter-measures as we have warned repeatedly,” the North’s Foreign Ministry spokesman was quoted as saying by the country’s official Korean Central News Agency. “The gang of Trump, being terrified by our accomplishment of the great historic cause of completing the state nuclear force, is driving the situation on the Korean Peninsula more and more close to the brink of war, acting recklessly without any sense of reason,” the spokesman said, according to the KCNA. In a separate dispatch, the spokesman also blasted the US over a United Nations Security Council meeting to be held on Friday in New York to discuss ways to deal with North Korea’s nuclear and missile programs. Tillerson is scheduled to chair the ministerial meeting. According to the US State Department, Tillerson will reaffirm the Trump administration’s push for “maximum pressure” on Pyongyang to give up its weapons programs. North Korea on Thursday notified the UNSC that it will attend the meeting as a concerned party. North Korean ambassador to the UN Ja Song-nam is expected to speak during a rare appearance at the UNSC. South Korea’s Vice Foreign Minister Cho Hyun will also attend the meeting as a concerned party. The North’s Foreign Ministry spokesman said that Washington is now trying to make evil use of its opportunity to convene the UNSC meeting. 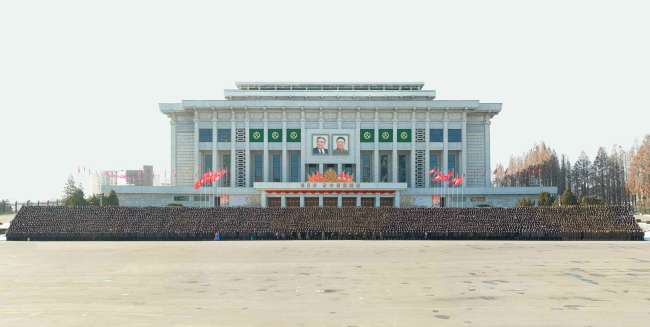 “The meeting is none other than a desperate measure plotted by the US being terrified by the incredible might of our Republic that has successfully achieved the great historic cause of completing the state nuclear force, the cause of building a rocket power, through the great November event,” he said, according to the KCNA.